PF-1 MK2 is the improved version of the advanced filtering power strip designed to power and protect budget audio and video systems. In the PF-1 MK2 better materials and components were used, and the modified construction of the device is based on solutions used in the EVO series of power conditioners. This is a special product in the GigaWatt offering, because it surprises with its solid construction and craftsmanship quality at the given price, and with the positive influence on the sound. The strip is made using high quality components. The distortion is filtered in a RLC filtering block. It is built using metalized polyester capacitors with low inductance and an IP (Iron Powder) filtering core. All components of the filters are soldered to a massive PCB with large cross-section of the traces, with silver solder. In this strip we also resigned from using traditional protective elements, like wire or thermal fuses, which throttle the free flow of current to the protected circuits and by this have a negative influence on the sound. Protection against overvoltage and power surges is guaranteed by a multi-stage protection circuit, composed of plasma sparks and new generation of UltraMOV varistors. Those elements, working together with a well designed, modern power grid, warrant a complex protection against overcurrent and overvoltage. The PF-1 MK2 uses an innovative current distribution system, being a proprietary development of the company. It is based on massive power distribution bars of 2nd generation, made of polished, high purity, cathode copper slabs (Cu-ETP). This system distributes the current directly to each pair of output sockets, using crimped and screw-tightened connections and cabling made from electrolytic copper wires with a cross-section of 2,5 QMM. The use of the star wiring topology and the high conductance and massive cross-section of about 30 QMM of each of the bars warrants an equal and stable power distribution regardless of the load on any of the strip’s outputs. The PF-1 MK2 power strip is equipped with six high quality power sockets GigaWatt G-040 Schuko, designed and manufactured by the company. The brass connectors of those sockets were silver plated at the factory, without the usage of intermediary metals, like copper or nickel, which could introduce unfavorable series resistance and voltage loss. The increased area of contact and the thick layer of silver guarantee sure contact with the plug pins. The sockets were additionally subdued to cryogenic modification and a demagnetizing process. In order to effectively protect children, the G-040 sockets were equipped with integrated anti-surge shutters (increased protection against touching, conform with VDE 0620). The PF-1 MK2 is also available with outlets of type NEMA 5-20R, used in North America and some Asian countries, and with Australian outlets of type AS/NZS 3112. The massive and durable chassis of the strip is made from metal. This creates a perfectly closed shield, protecting the inside filter and power distribution system from RFI noise. The power strip is also equipped with a LED signaling proper function and power available on the sockets. The strip is also equipped with a high quality IEC socket, allowing their user to connect any power cable. 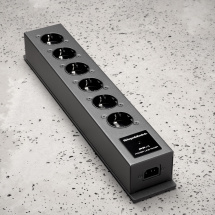 The power strip is equipped with the power cable LC-1 MK3 with 1.5m length. To fully utilize the maximum potential of the PF-1 MK2 we recommend the usage of the LC-3 MK3 or LC-2 MK3 power cable. “A power strip is bare necessity in case of most systems. And if we already use one, it should be of good quality, what does not necessary mean expensive. The power strip (the basic model) from the Zgierz based GigaWatt is exactly like described, and it received a result bashing its competitors – 60% (the highest result in our plebiscite). It has a built-in over-current protection (up to 20kA) and is being delivered with the LC-1 power cable bundled, worth 200 EUR. It is a piece of solid workmanship, both in electrical and mechanical terms. Internal connections are made by means of thick rails made from pure copper. Due to that solution it does not limit the quality of sound, its dynamics, transparency or saturation of timbres. “One of the cheapest ways known to us of breeding power sockets, which does not cause any degradation of the sound compared to the wall socket. Even more, this basic power strip from the Lodz based company GigaWatt included in the package, worth 200 EUR. Despite the relatively low price, the PF-1 has a very solid electric and mechanical construction. Internal connections are made with thick metal rails, rather than thin cables. Due to this, the sound does not loose any dynamics or transparency, while the timbres become more pleasing and richer.